These Owls are also known simply as White-faced Owls. Because of several distinctions from other Scops Owls, some specialists give this Owl it's own Genus - Ptilopsis. The Scops Owl is mostly resident throughout most of Africa south of the Sahara. Small grey, nocturnal Owl with striking white face, surrounded by black edging, and large prominent ear-tufts. Their eyes are Orange. They have the largest ear openings of any Scops Owl. Their size is 19 to 24cm (7.5-9.5'). They have long ear tufs and black rimmed facial disc. Like other small owls, the White-faced Scops Owl is generally insectivorous, although they may take small birds, rodents and other small mammals. Animal Prey are frequently larger than caught by other species of Scops Owl. They hunt from an open perch and drop down on prey. Largely insectiverous, small birds, rodents and other mammals. Their breeding season varies greatly. In Zimbabwe, it is August to November. Further South, between July and February. They often nest in abandoned nests of of other birds, from pigeons to Eagles. They will also use tree hollows and have also been known to use ground nest sites. 2 to 4 shiny, white eggs are laid at intervals, incubation beginning immediately. From the day of laying, incubation takes about 30 days. Chicks move out onto nearby branches at by about 4 weeks, and begin to fly a few days later. The White Faced Scops Owl is fully nocturnal and mostly insectivorous. It is a bird of scrub and bush territory, and often uses ground nest sites for breeding. 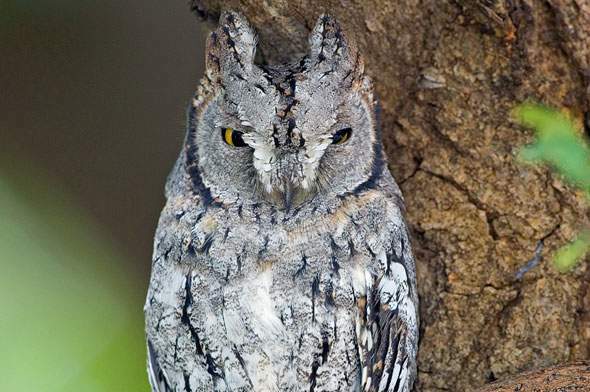 The genus Otus can largely be divided into two types of owls, the Screech Owls of the New World, and the Scops of the Old World. There are about 40 different owls in the group spread right across the globe. Most of the Otus owls are inhabitants of tropical regions. When these birds are disturbed during the day, the can elongate their bodies and lean sideways, which will help them resemble the branches on which they roost. Scrub and bush, woodland with sparse ground cover. Acacia forests and savannas. Resident throughout most of Africa south of the Sahara.